How To Preserve Wedding Dress? There are some events in the journey of our lives which are extremely important and worth remembering for a long period of time. Our wedding is perhaps one of the most important events of our life. Hence we would like to remain memorable and be etched in our heart and mind for as long as possible. As women many of use spend thousands of dollars on wedding gowns. However, once the event is over and the big day has gone by, we often wonder what do with the wedding dress. We have spent so much on it that we would not like to throw it away. The first and most obvious step to keep your wedding dress in good shape is to have it cleaned thoroughly. You must not do it on our own unless you are very sure about it. There are many professional wedding dress cleaners who could help to do a thorough job of the cleaning. It should be done as early as possible. It is quite possible that the wedding dress could have attracted dust and perhaps even some stains. Hence the onus lies on you to act immediately and get the stains removed urgently. Stains once they set are difficult to remove and in many cases they might become impossible to get rid of. Therefore having it cleaned immediately is the first step towards proper maintenance of the wedding dress. It would be advisable to start the cleaning process at the hem. This is because it is the area which gets dirty quite fast. There are professional cleaners, who scrub the hem with hands and ensure that the dirt is removed. If there are some tough stains they treat them with chemicals. It is however important that you must always be sure that soft and natural stain removing solutions are used. Though synthetic stain removing agents might work, they may also damage the hem and the entire wedding dress might become unsuitable for use again. 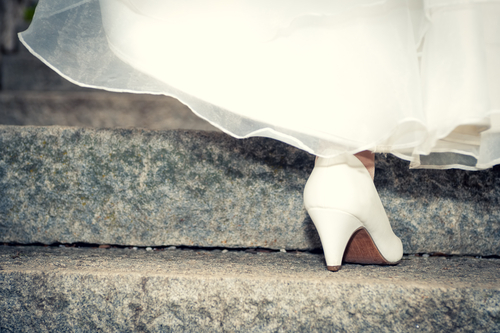 There are many brides who use correction fluids on their wedding dresses to prevent stains forming on the same. This is not right because these fluids are often made from powerful and harmful synthetic chemicals and they could damage the fabric of the wedding dresses. Professional cleaners may also find it difficult to remove these correction fluids and the stains they leave behind. One of the most common mistakes that many of us make is to delay the process of cleaning the wedding dress. It could happen because of preoccupation with the busy schedules which one may have to attend. Hence before the wedding, you must keep in mind the need to clean your wedding dresses at the earliest. In today’s mobile phone technology it is not a big deal to have a reminder alert set for cleaning the wedding dress once the main even or the most important day is over. You could also perhaps inform about this to your professional launderer. They will remind you and they may even drop in to your place and have the wedding dress collected for cleaning and preservation. 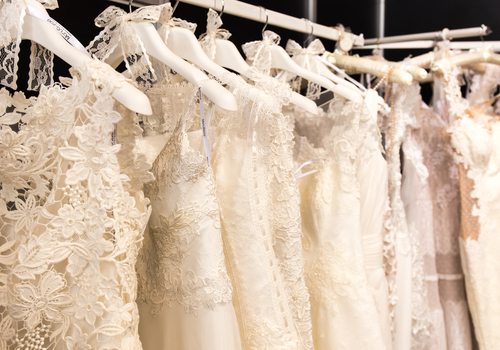 You have two ways to preserve your wedding dress once it has been cleaned and the dress is made free from stains. You could let it stay with your launderer because they can arrange for the best storage facilities. However, this might come with a cost and when one looks at it from the long term perspective it could be a big amount of money. Therefore a better option would be to identify a suitable storage place in your home where it can be preserved properly. You must ensure that the place chosen is good and it should not be a place where there will be a constant traffic of other dresses. You could make a special rack for the wedding dress and have it closed with a door and even have it locked. While having a separate storage space for the wedding dress is a good idea, you must be sure that it is moisture free and is suitable for keeping the dress for a long period of time. You must use moth balls and other such chemicals to ensure that it remains in good condition and is free from microorganisms and other such things which could damage the dress beyond repair. The place which you choose should also be free from sunlight because heat beyond a point will also damage the wedding dress beyond repair. 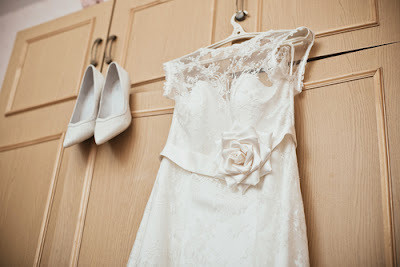 You must not forget to take the wedding dress from its storage place once in a while to ensure that it is in good shape. If needed you could brush it up and then put it back. You also must make it a point to ensure that it is packed well (perhaps in a vacuum packing method). This will certainly ensure damage due to moisture and other such substances. Hence at the end of the day if you are informed and then take steps to preserve your wedding dress, you can be sure that it will remain in good shape for a long period of time. You can easily hand it over to your daughter in the best of condition for her wedding.